Try something new this Thanksgiving – whip up a new dish with a super delicious holiday recipe. Heat oven to 375 degrees F. Place squash, cut side up, in 13-by-9-inch baking pan. In large skillet over medium heat, heat oil until hot. Crumble in turkey; add onion. Cook and stir until turkey is no longer pink and onion is tender; drain. Stir in salsa, rice, corn, chili powder and garlic salt. Divide mixture among each squash half. Cover. 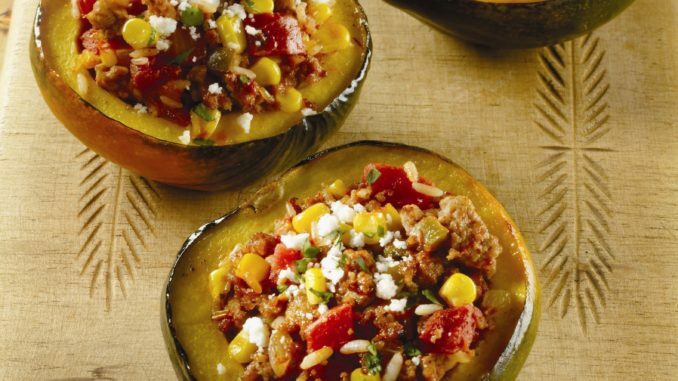 Bake 40 to 50 minutes or until squash is tender. Sprinkle with cheese and cilantro. Serve with Mexican crème, if desired. Serves 6.